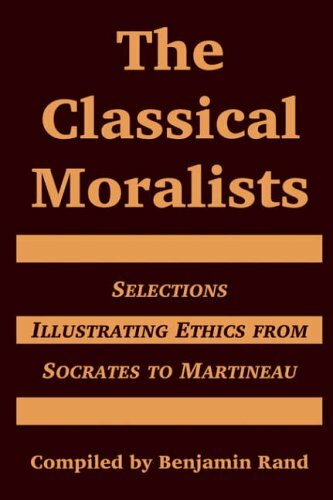 The Classical Moralists is a companion volume in the field of ethics, to the author's Modern Classical Philosophers in the domain of philosophy. The book is virtually a history of ethics, based not upon the ordinary description of systems, but upon selections from the original sources and upon translations of the authors themselves. In 1882 the president and fellows of Harvard elected him to the Walker Fellowship which permitted him to travel and study abroad. He proceeded at once to Heidelberg where he studied under the celebrated philosopher Kuno Fischer. Before returning home he travelled much in Germany, Switzerland, Italy and France. Dr. Rand is the third man whom Harvard ever admitted to the degree of Ph.D. in the department of philosophy. His thesis presented for this degree was "Consciousness and Immortality." He made outstanding contributions in Philosophy and he was internationally known as a Philosopher.